Weary travelers. You've seen them-everything they own crammed into their luggage. Staggering through terminals and hotel lobbies with overstuffed suitcases, trunks, duffels, and backpacks. Backs ache. Feet burn. Eyelids droop. We've all seen people like that. At times, we are people like that-if not with our physical luggage, then at least with our spiritual load. We all lug loads we were never intended to carry. Fear. Worry. Discontent. No wonder we get so weary. We're worn out from carrying that excess baggage. Wouldn't it be nice to lose some of those bags? Travelling Light by Max Lucado was published by Thomas Nelson in March 2006 and is our 12679th best seller. 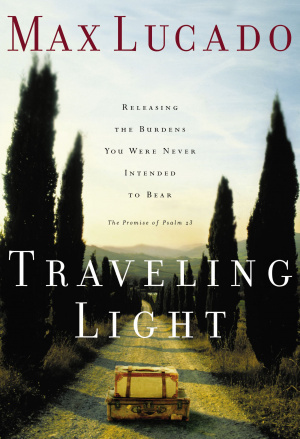 The ISBN for Travelling Light is 9780849913457. Be the first to review Travelling Light! Got a question? No problem! Just click here to ask us about Travelling Light. Does this edition of "Travelling Light" include a study guide please? A:No, this version of Travelling Light does NOT include a study guide.